So I finally took the plunge and dyed my hair... myself… for the first time ever. EEP! I’ve been meaning to get it done professionally for ages but could never justify the hefty price tag – around £100 at the top rated places in Edinburgh just for the colour! – but after speaking to a friend from work who told me how easy it was to dye yourself, I decided to give it a go. And if it went wrong, I’d at least be getting my £100-worth by getting the hairdressers to fix it! 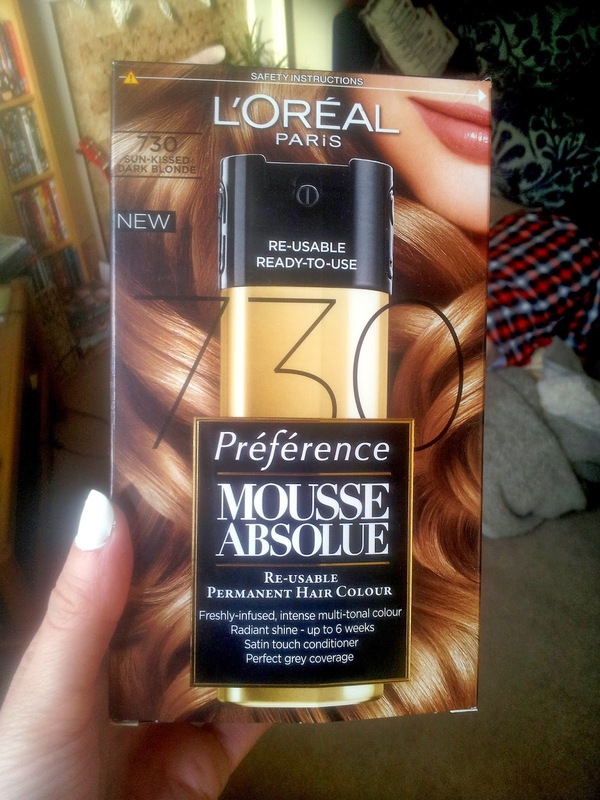 I went for this dark blonde colour by L'oreal Paris, purely because I’d been looking at these pictures of MK Olsen and Blake Lively that morning and swooning over their dirty blonde locks. It’s a mousse dye, which I’ve never seen before, but I would actually really recommend it to first-time dyers. It’s so easy to use and, because it’s a mousse, much easier to apply to specific areas with little risk of it running or dripping – very handy for people like me who manage to spill things everywhere. I wanted to dye just the very top of my head, the bits where my natural hair has grown through, and some of the bleached blonde bits in the mid sections, leaving the very ends the same bright blonde (to get a sort of ombre look basically) so it was really useful to be able to apply the mousse so specifically to areas without it running down into the blonde ends. The one thing I would say about the dye is that you reeeally need to scrub your hairline to get it off afterwards as there was a tonne of residue left around my roots which meant I had to wash it a second time to get it all out. Also, it seemed to work on parts of my bleached hair more than others weirdly, so you have to be careful to apply it really evenly and really massage it in. Other than that though, a really simple and easy to use hair dye. Plus, it is pre-mixed so you can store it and use it again for touch-ups! What dya think? As you can see, the colour on the mid-lengths is a bit uneven but seeing as i didn't completely ruin my hair, I'm pretty happy! It’s nowhere near as drastic as the colours I usually go for, but I’m wanting to give my hair a bit of a rest from bleaching so that it can recuperate and get healthy again (and hopefully grow into mermaid hair! ), so this is the perfect colour for that. Have any of you dyes your hair yourself? Or used this dye before? I’d love to know your thoughts.